It has been a little while since my last post and with good reason! You see it was one of those weeks! My Little Miss E was struck down!!!! Tuesday it got a little interesting - vomiting gone, runs start, you know, the nuclear type kida like the No. 3's babies have! Wednesday rolls around I am tired (Master N is yet to master sleeping through the night) and Little Miss E still has the runs! So Wednesday we head to the doctors all 4 of us. Little Miss E drops a bomb (am I mean nuclear) no changing facility, Miss S pulls a toy out of the rocking horse's bum and decleares this to the whole waiting room, with a hearty "look what I got from up the horses bum!" (whole waiting room bursts into laughter as do I). Finally see the Dr and the conculsion is go home and hydrate with artifical bubblegum flavoured peadalite (yummo, I mean gross!) and head to A&E if it gets worse. Thurday Little Miss E is dropping nuclear bombs everytime she has a drink, was loosing a heap of fluid, and I had to clean a number of accidents off the carpet (I have a weak stomach, concentrating on nice things, quilts, sewing, fluffy bunnies ... that sCRAP doesn't work, I just grined and bared it!). It is here that I admitted defeat! We, me and 4 kids head to A&E, picking up hubby on they way. We got seen immediately and for this I am truley grateful!!! Conclusion: we measure in and out at the hospital giving Little Miss E 5ml of fluid every 1min and weigh the nappies. Did I mention I had done this at home and was loosing?! In the end Little Miss E is getting addmitted and a gastro tube put down to hydrate her while she sleeps. Mr Sew Stitched Up has to stay with Little Miss E the night. Little Miss S is still amazed at what she can pull out of bums (well if I found a toy up a horses bum I would be too, lol). And me like a big baby I am just wanted my Mum. It took two nights in hospital for the run's to stop and Little Miss E to get hydrated. Little Miss E is fine now, 2kg lighter, but fine, the evil little virsus that caused all of this was a rota virsus, which struck my little girl down like .... (thinking of something witty)... kryptonite (not that witty) ... well you get the idea. I love using variegated thread! It's so fun! In our house Santa is very generous and leaves some lollies - This is Miss S's Lollie Bag, I made today, Miss E and Miss J's are coming. I am yet to make the little name tag. Here is the tutorial if you are interested. This is a tutorial find people! Mommy Blessings has this fairy wing tutorial. Glitter and fairies people, how could you go wrong (is it wrong that I may try them on when done)! Go check her out! There are some neat tuts over there! Right I am off to partake in ... fairy wing shaping! Have a great week! Hear that? Zoom Zoom Zoom. That was me this week! Man oh man. Last minute Freaky Friday Costume for Miss J - The Queen of Hearts, Made the night before in an hour. All I have to say is " I heart eleastic" Please don't look closely the sewing is TERRIBLE! What I would give for a little more heads up! Miss J likes to tell me things at the last minute! Boy I hope she grows out of that, and soon! Then Miss J was Invited to a Birthday Party... what to do... Tissue box cover! And then there is this, I call it "Space Cowboy" Made using this tutorial from Kellie, Its for Master N for Christmas. My sewing machine didn't really want to play while I was making this. It was a bit of a practice before I have a crack at Megs Garden. I don't heart my sewing machine at the moment! A phone call to Mum and a chat about the feed dogs hopefully has me on the right track now. "I Heart My Mum" and people who take the time to share and make tutorials, you rock! I use this because I can't can't use a thimble, I am thimble challenged! So I use this leather-finger-sock thimble, and it works a treat! I was using a little leather thimble pad but as the weather warms so do my hands (i suffer from sweaty hands) and it just doesn't stick to my finger. So now I am off to Heart MYSELF! Put my feet up and have a look at all those wonderful blogs out there! I also wanted to say thanks for the support! I am a newborn quilter, and all the help and encouragement means alot! You all inspire me. 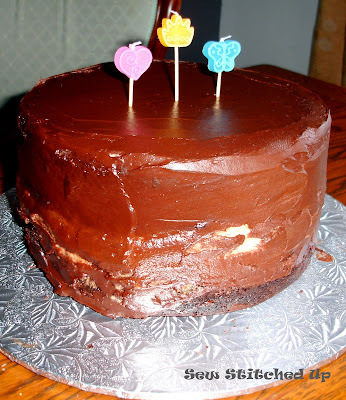 This post is FYI and to get me another entry to a giveaway - If you read my last post you would have seen and not so subtle hint directed at my beloved to obtain the new Piece O' Cake Desgins book Applique Outside the Lines. 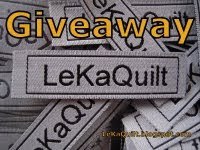 Lekaquilt has lost the plot and giving a copy away! - Yep you heard right giving away! I know, my chin is on the floor too! Click the button below to head to her site to enter! Best of luck to all those that enter! Have a great weekend - I am off to prep some more bits for my Jo's Coat! This post is about me blowing my own trumpet, hehe. Today I think I am 'da bomb'. Miss S and Miss E are just not interested in my little achievement. Master N is just too young to appreciate anything that doesn't produce milk. 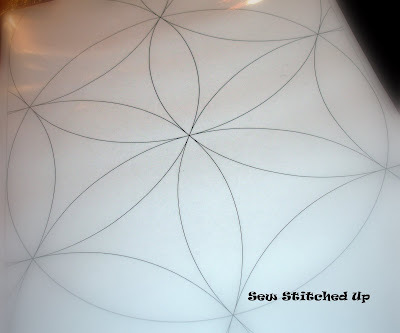 I have never attempted applique before this, Infact the thought of applique scared me! Imagine colds sweats and the likes! And as I have mentioned before I am not the best at following instructions. But boy I think I am pretty darn special right now, lol. Kellie's Little Quilt Along has opened a door for me! Jo's Coat is only the begining! Of what my become an obsessive, unhealthy relationship with applique! Wow, what a busy week! After seeing on a blog a Chrismas countdown, and having Christmas junk mail arrive, I had a Christmas meltdown. The one that happens when you realise that Christmas is only just around the corner, screaming head on toward you, and you now have very little time to make those little things you wanted to gift to people ... breathe! It's not that I don't like Christmas, I enjoy it very much! What I don't enjoy is the onslaught of junk mail (which just gets dumped in the recycling) and consumerism that comes with it. So this year I have decided to make the kids something each. Nothing huge that will require a herculean effort, but something special just for them, made for by their Mum. I quite like that idea! and the chopstick incident... enough said! Smaller stitches next time. And then there is this. Something just for me, from me, to help me keept my sanity! I am not naturally drawn to these colours, so I hope this will offer a challenge for me! Last but not least this is the bit where I say look at what my husband and Miss J made me for my Birthday! Aren't they cleaver! Impressive isn't it! Let me tell you it was delish! Right I am off, I am sorry if there are terrible spelling mistakes I am posting rather late at night, and would you believe I have been trying to post this since Friday! Till next time, enjoy yourselves and have fun! Today was not a good quilting day! After seeing Cathy's Wave Runner quilt I thought I would have a crack at it. and it turns out I am a bit of a spaz when it comes to all things wavy! You know there are just somethings in this world that aren't ment to be and this was one of them! I think the problem may have been that some of my waves were a little too ambitious, and at this point I will admit I am not the best at following instrcutions. What was that? oh, you want me to say it a little louder? Ok. I am not the best at following instructions. So today I learnt an all important lesson lessons. Read the instructions, follow the instructions, become one with the instructions. Or you end up with piece of fabric that resembles a bra rather than a quilt top or anything that could be cut and made into a quilt top! Oh well, never mind chalk this one up to experience. Here is the pic for those of you wondering what a bra quilt top thing looks like. And all I had to do was read the instrustions! All spured on, I churned out these for Miss J (my little enviro warrior), I like the hearts, don't really fancy the enviro skirt. Miss S wasn't left out and is the proud owner of what she calls the "pirate skirt."